Info "Change the skeleton's pose to match the example!" 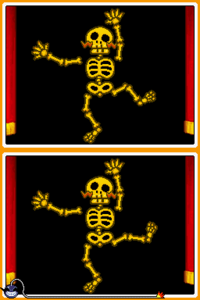 Dead Simon Says is a microgame found in WarioWare: Touched! in the Super Zero stage. The objective is to move the parts of the skeleton to match the one on the Nintendo DS's top screen. When the microgame starts a Fronk makes minor appearance before running away. 1st level difficulty: Move one part. 2nd level difficulty: Move two parts. 3rd level difficulty: Move two jointed parts on a leg or arm. This page was last edited on February 15, 2018, at 09:15.